As most readers will know, the 464+ uses exactly the same PCB as the 6128+, just that the 6128+ specific components for the extra 64K and floppy control have not been installed. The following guide will explain what parts you need and how to go about converting your 464+ to a 6128+. Other than the obvious tools required such as a soldering iron , cutters and a screw driver, there are quite a few components you'll need to source. Some of these are standard components that are still readily available and cheap to acquire, others such as the SED9420 Data Separator, the µPD765 Floppy Controller and the RAM ICs may prove more difficult to find. After removing the PCB you'll notice that all the holes for the new parts have already been filled with solder. 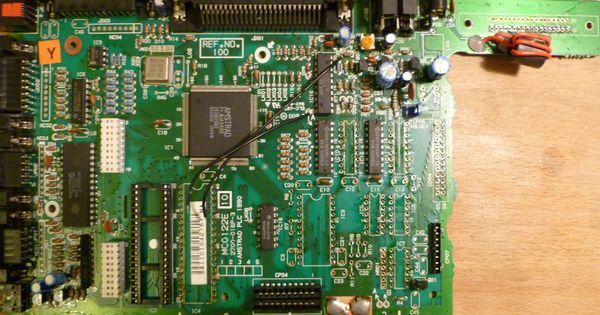 Amstrad didn't do this to make it harder for you to convert, this is merely a side effect of the wave soldering process that was used to solder the board. So the first thing you'll need to do is remove all this solder. You can do this using de-soldering gauss or a pump, depending on your preference. Don't use a drill! Drilling will damage the via connections inside these holes! In most cases you can apply a decent amount of heat to remove the solder, however be careful when preparing the holes for the 41464 RAM IC's as they are very close to the original 64K ICs and too much heat in this area could damage the original RAM ICs. C4 and R55 are also directly connected to the ASIC, so care should be taken when soldering these parts also. You will also notice that there are also two black bridge wires running from the top of the PCB down to two of the holes you need to use for C21 and C23. 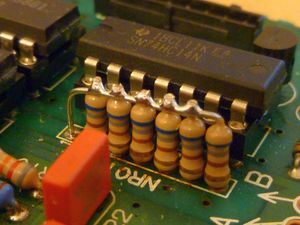 These connects will still be required after the mod, so you will need to remove and later re-connect these wires to the legs of the capacitors. Take note of which wire goes to which capacitor! 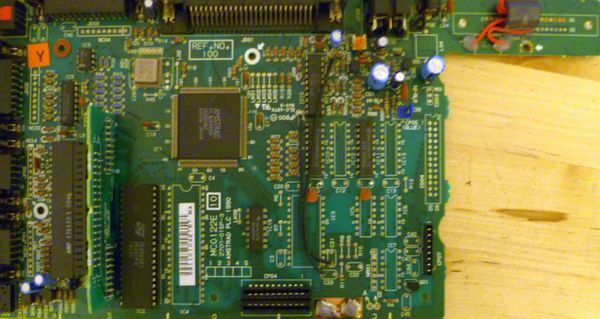 Although most of the parts are concentrated around the bottom left area of the PCB, there are a few other parts hidden around the board that need to be added. R28 (Directly behind the analogue joystick port) tells the ASIC that the CPC has 128K instead of 64K. R55 (between the ASIC and first RAM IC) connects the NCAS1 signal to the new RAM. Behind the power socket, LR04 and C39 are required to supply the floppy disk with power. Althought the new ICs could be soldered directly to the PCB, I chose to use sockets, to make any future modifcations or repairs easier. There is more than enough room inside the case to allow for the extra height needed for the sockets. The components can be added in any particular order, although to make testing and debugging easier, I add only the 64K RAM components first and tested this before I continued with the floppy control components. The minimum parts to get the extra 64K working are: R28, R55, C12, C13, IC12 and IC13. Remember that the black bridge wires must also be connected in order for the CPC to run in this state. If you intend adding an ABBA switch to the CPC, it's a good idea to make the modifications to the external floppy connector before you solder it to the PCB. If you have borrowed the floppy power connector and leads from a PC, then you will need to remove the yellow wire from the connector and move the red wire to the position where the yellow wire was, as Amstrad (in their infinite wisedom) decided once again to steer clear of unnecessary things such as standards. When all the components have been added the board will look quite a bit fuller and you should now have a 6128+ PCB in front of you. If you have chosen to add the external floppy connector, you will need to cut the additional hole in the casing, but no other case modifications are required. The tape functionality will still be there, but will require the |Tape command from now on.